New data suggests that Apple marketshare took a very slight hit in a three month period ending in October in the U.S., because users put off purchasing phones while waiting for the iPhone X. According to Kantar Worldpanel ComTech on Tuesday, customers holding off on purchases caused a 7.6 percent drop in mobile sales in October when compared to Oct. 2016. Android manufacturers saw a 8.2 percent increase, also fueled by the continuing decline of Windows mobile. The data set claims that in those three months, Android held 66.2 percent of the U.S. sold smartphones, with Apple holding 32.9 percent. In 2016, Android held 58 percent, with Apple claiming 40.6 percent. It is a different story in China, though. 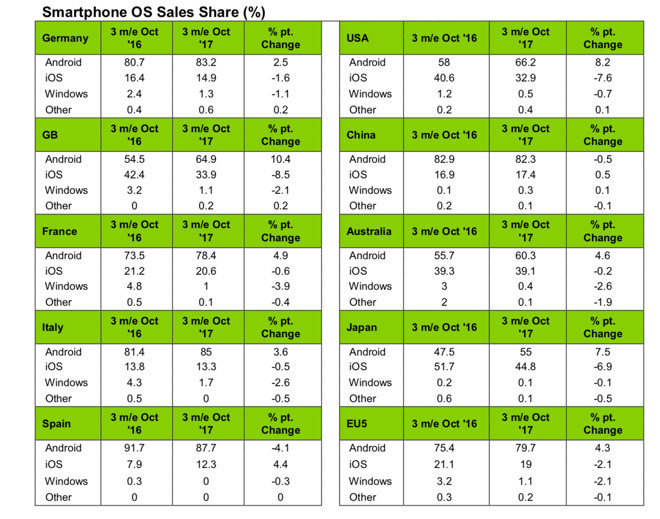 Apple sales increased in October by 0.5 percent year-over year, with Android falling by the same amount. "It was somewhat inevitable that Apple would see volume share fall once we had a full comparative month of sales taking into account the non-flagship iPhone 8 vs. the flagship iPhone 7 from 2016," said Kantar Worldpanel's Global Business Unit Director Dominic Sunnebo. "Considering the complete overhaul that the iPhone X offers, consumers may be postponing their purchase decisions until they can test the iPhone X and decide whether the higher price, compared to the iPhone 8, is worth the premium to them." Kantar Worldpanel also noted that most of the homegrown Chinese brands like Meizu, Coolpad, ZTE, and Lenovo were declining, and the decent was feeding Apple and Xiaomi. Also feeding the pair is Samsung, with data showing a continuing decline to 2.2 percent of the Chinese marketplace. The data for the study was gleaned by tracking mobile phone user's behavior, including purchases, bills, airtime, source of purchase, and active usage.